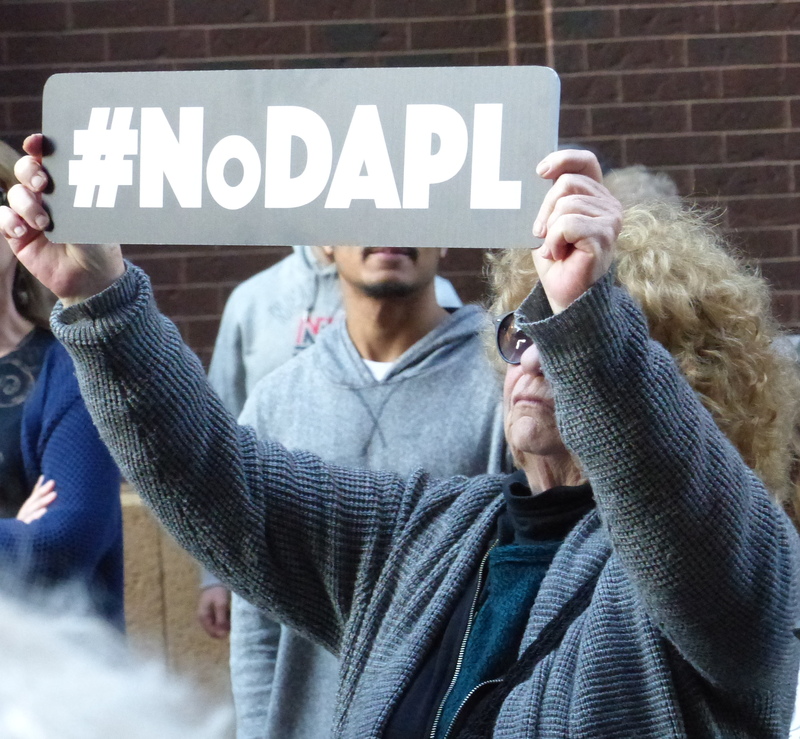 From Mears Park rally against the Dakota Access Pipeline. Breaking: Reuters is reporting today that North Dakota officials are going to use heavy fines rather than arrests to deter people supplying the Oceti Sakowin Camp, the main camp used by those opposing the Dakota Access Pipeline (DAPL). The story was headlined: North Dakota officials hope to quell pipeline protests with fines. The eviction order went into effect immediately upon signing, Nov. 28. Tonight was the first all women lead action to the front lines. I am honored to stand with my indigenous sisters and elders. We filled the bridge where Sundays atrocities took place. At first we were held back by the men who were afraid to let us go through. But they quickly saw the truth at hand. It was time for the women to lead and them to trust and protect it. DAPL allowed us to walk all the way to the [barricade]. I was one of the few who was honored to be at the front in service with media and in deep prayer. We wept on the ground there, we offered the other side our unconditional love as women. Masses of women sat behind this in complete Silence with the men standing behind. The power of that silence allowed our ancestors to be fully present with us. We were granted permission by the army corps to go down on the other side of the river and have a water ceremony. This was the first time the access had been peacefully granted and even supported by the officers. We all stood in our humanity today. The matriarchy is rising, not without its roadblocks, but we push on, like the river. We united as women today. I know I said the other day was the most powerful of my life, but then today happened. Today we believed in our sisters and their power to bring peace to this movement, we believed in our combined vision.. and we were unimaginably rewarded. 1. Donate to our fundraiser. Even though we met our $1500 goal, any additional money will go toward buying additional wood and renting large trucks that can travel to Standing Rock. Firewood in the Twin Cities typically costs $300-$400 a cord. 2. Seek out dry oak, ash, and maple fallen trees or logs that could be processed as firewood. 3. Ask local businesses who sell firewood whether they would be able to donate any to the movement. 4. Send posts and emails asking friends who might have a source of processed firewood whether they might be willing to donate any. If you are able to access firewood through any of these means, call Alex (203)-246-3105. Thanks for this. That Matriarchy Rising segment is amazing.